"But the Buddhism of Kanishka differed much from the ethical creed of the great Maurya. the human teacher of the four noble truths and the noble eight-fold path now became not merely a deva(deity) but devatideva (the god of gods). Like the Blessed Lord of the Bhagavatas or Vaishnavas he is repeatedly born in the world of the living to remove the affliction of the creatures and reveal to them the true law." - An Advanced History of India by R.c.Majumdar, H.C.RayChaudhuri and Kalikinkar Datta. 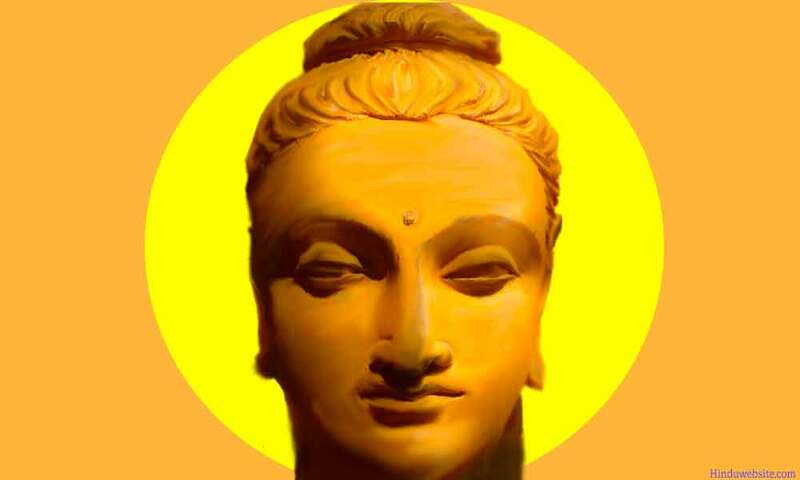 A new school of Buddhism known as Mahayana Buddhism or Mahayana school of Buddhism or Mahayanism became prominent during the reign of Kanishka who ruled large parts of the Indian subcontinent in the late second century A.D. Mahayana literally means a greater vehicle. Although its exact origin is not clearly known, it is argued that the basic tenets of this school can be traced directly to the teachings of the Buddha himself. Followers of this school of Buddhism did not believe that they deviated from the teachings of the Buddha, but rather they rediscovered his lost teachings. Mahayana Buddhism differed from the orthodox Hinayana School in many ways. Some of the basic differences between the two schools are discussed here. The Buddha did not make any attempt to validate the existence of the first cause or the Cause of the causes. In the early Buddhism there was no mention of any Absolute God akin to Brahman of the Upanishads. The followers of Mahayana deviated from this early stand of the Buddhists and declared that Buddha himself was the first cause and that as the Absolute Being he pervades and presides over the whole universe. Mahayanists describe this being as Adi Buddha, whose manifestation on earth was the corporeal Buddha who came to the earth and preached the Dhamma. This Being, the Eternal Buddha, has three bodies or three manifestations. They are the body of essence (Dharmakaya), the body of bliss (Sambhogakaya), and the created body (Nirmanakaya). The body of bliss presides over the highest heaven, while it is the last one, the created body, which manifests on the earth for the welfare of earthly beings. The body of essence is the ultimate Buddha, the supreme lord of the universe. It is the One, the eternal and the absolute. It is omnipresent and omniscient and manifests itself as the other two bodies. It presides over the entire universe and all the numerous Buddhas who rule other heavens and other worlds in various parts of the universe. Mahayana scriptures especially speak of five Buddhas, namely Vairochana, Askshobya, Ratnasambhava, Amitabha and Amoghasiddha. The body of bliss exists in the highest heaven and will continue to exist till all the beings attain Nirvana. Sukhavathi is the name of the heaven over which it presides. Here enlightened beings remain seated in front of the Buddha's throne, in lotus buds, floating amidst a lovely lake. Amitabha is the name that is given to the Buddha who rules this heaven. The created body is a manifestation of this body of bliss. The Buddha discouraged all speculations about the true nature of Nirvana. The Mahayana school made a radical departure from the original teachings of the Buddha in this respect. According to its tenets, Nirvana is not just a final liberation from the suffering of continuous becoming, but also union with the Buddha's Body of essence. Thus Nirvana that we are talking about here is not very much different from the Vedanta concept of the blissful union of the soul with the Eternal. While it is difficult to speculate on how and why the Mahayana school emerged so many centuries after the Buddha's death, we have to admit that its cause was rooted in the ambiguity that surrounded the early Buddhist stand on such concepts as soul and God. But definitely the foundations of this school did not lay in the scholastic and speculative exercises of some innovative minds, but probably in the inner revelations that emerged out of deep spiritual experiences during deep meditations and contemplations. Vajarapani, another Bodhisattva, holds a thunderbolt in his hands According to the original doctrines of Buddhism, a Bodhisattva attains Buddhahood after passing through many births and deaths and performing many noble deeds. But according to Mahayana, a Bodhisattva cannot be a selfish being who would think of his own salvation when the entire mankind is steeped in sorrow and ignorance. True to his compassionate nature, he would defer his own salvation for the welfare and deliverance of other beings. Thus Mahayana School shifted the emphasis from personal salvation to universal salvation, from the ideal of Arhat to that of the Bodhisattva, and the concept of accumulating merit for ones own benefit to transferring of ones merit to the benefit of others. A monk should not be a lamp unto himself, while there is darkness every where. He should if necessary sacrifice his own salvation in order to help others to achieve it. Out of his unbound love and compassion, he should sacrifice or share the merit of his own good deeds with all the sentient beings so that they too may secure liberation. Surely the Bodhisattva, the most purified being, would not remain quiet when there are chaos all around. Thus when a follower of the teachings of the Buddha, attains the status of a Bodhisattva, he takes upon himself the sorrow of all the worlds and all the beings. He suffers willingly in order to mitigate the suffering of others. He resolves to improve the merit of others, through self-example and immense sacrifice. The Mahayana school speaks of many Bodhisattvas. Avalokiteswara, also known as Padmapani, is extremely compassionate and reaches out to extend help to beings of all the worlds, even of the lowest purgatory. Manjusri stimulates understanding among beings, by destroying error and falsehood. He also helps the beings to cultivate the ten spiritual perfections, such as charity, good conduct, courage, meditation, insight, etc., which are essential for the evolution of each into a Bodhisattva. Another Bodhisattva, Vajrapani, holds a thunderbolt like the deity Indra of Hinduism and fights against evil and sin. Kshitigarbha is another Bodhisattva mentioned in the Buddhist texts. He rules over the hell or purgatory more in the capacity as a moral guardian and fatherly figure than a torturer of the sinful, who works in the best interests of their salvation and tries to alleviate their suffering. Finally we have Visvapani, the Bodhisattva who is awaiting his birth in this world as the Maitreya Buddha. It is to be noted that these Bodhisattvas reside in the higher worlds out of compassion, by deferring their own salvation, by taking upon themselves the sorrow of all beings, and working for others' salvation. They can attain Nirvana any time they want. But they do not do so till every one, even the smallest insect had attained it. They are personification of boundless compassion and extreme self-sacrifice. Thus the idea of suffering saviors is a concept that the Mahayana introduced newly into Buddhism. The same concept exists in Christianity also. For a follower of Mahayana Buddhism, Christ is very much a Bodhisattva, while the body of bliss (Sambhogakaya Kaya) is the father in the heaven. The Buddha prohibited the monks from indulging in unnecessary speculation on such subjects as the existence of God, the nature of reality or Nirvana. But Mahayana school did not seem discourage speculation, for it produced many systems of philosophy concerning the nature of reality and existence. Two important schools of philosophy are worth mentioning here: Madhyamika and Yogachara. The former was based upon the Sunyavada (Theory of Void) of Nagarjuna, according to which the entire existence, samsara as well as Nirvana, is unreal. What is real is the Void, the emptiness, which is the Body of essence or the Adi Buddha. It alone can be termed as the true existence. The Yogachara school considers the world unreal or a dream because it is also made up consciousness. The only reality is "Suchness," also called Dharmadhatu, which is akin to Nagarjuna's "Void". The Yogachara school produced many great philosophers like Asanga, Dignaga and some important works like the Lankavatara Sutra. Thus, Mahayana Buddhism was a radical departure from the original teachings of the Buddha as practiced by the Hinayana school. It reinterpreted Buddha's teachings and introduced elements of theism and ritual practices of ancient India. It deified the Buddha and made him into an object of both worship and contemplation.